Last week had a few mild upsets and came close to having some major drama. This week is full of rivalry games, but how many represent a legitimate chance at high point values? Better yet, what even odds games have the best chances at 200 or 300 points? 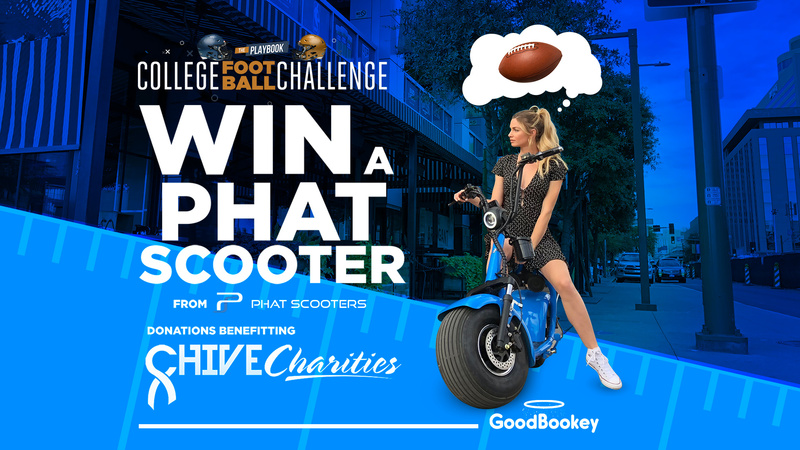 Keep reading for Dr. Jason Senkbeil’s expert advice aka your best shot at winning a Phat Scooter! Mississippi State at Ole Miss 425: Ole Miss cannot go to a bowl game so this is it. The Landsharks (8,109) have the offense to hang with anybody, but against good defensive teams, they have struggled. State (44,5) has a good defense and a high school offense that can only be stopped if you are physical enough. Ole Miss is at home though. UCF at USF 565: This emerging rivalry has been great in past years. UCF is only one win away from 2 perfect consecutive regular seasons. They have shown weakness this year but Milton is an outstanding quarterback that will not lose. USF has been too weak on defense this year to end UCF’s reign. G Tech 700 at Georgia: I love the Tech triple option, but Georgia should be able to slow it down and Tech will not be able to stop Georgia’s offense. Maryland 515 at Penn State: Maryland has some talent but they only seem to display it when they want to. They should have beaten the Buckeyes last week. They confuse me. Penn State at home should win this and their D is much better than the Buckeyes. South Carolina 1600 at Clemson: The Gamecocks have a decent offense but their D is not very good. Clemson and their nationally best defense should adjust to any new wrinkles and slowly strangle South Carolina. Kentucky at Louisville 750: Will Louisville have more motivation post-Petrino? They have been awful this year so picking them is a huge gamble. Kentucky is sliding, but sliding this much? Kansas State 525 at Iowa State: K State has won 2 in a row, but Iowa State is tough at home and should close out the year strong. Even with the low odds, this might be the leading upset contender so far. Notre Dame at USC 430: Notre Dame is a playoff team. I finally stopped picking against them last week. They are good. Maybe if I say that USC has no chance then maybe there is a chance? USC has looked terrible lately. BYU 515 at Utah: The Holy War. BYU has a stingy defense and not much offense. Utah is more balanced. Good BYU beat Wisconsin. Bad BYU lost to Northern Illinois. Is a gamble on good BYU worth 515? Can good BYU beat Utah? Oklahoma 190 at West Virginia 190: OU’s incredible offense is still clicking but their defense is going the opposite direction. Eventually, they will be outscored. On the road in Morgantown sounds like a place for that to happen. Washington 250 at Washington State 159: Will Washington ruin Washington State’s magnificent season? They have the defense to do it. The apple cup should be a terrific game and Washington at 250 points is a good gamble. Michigan 152 at Ohio State 268: Michigan wants this game! The Buckeyes looked bad last week. If Harbaugh does not beat Meyer and Ohio State this week it will never happen. Florida 153 at FSU 265: FSU beat BC last week and suddenly looked better. Both teams have good defenses and if FSU can get a few turnovers this is possible. Florida is inconsistent so be cautioned. Pitt 285 at Miami 144: Pitt has been on fire since midseason. Miami has been the opposite until last week. Are those point values right? Is there a major injury I am missing? If not this 285 is looking good. LSU 190 at Texas A&M 190: Is this the year that A&M finally beats LSU? I am not sure which way to go on this one. Utah State 235 at Boise 162: Boise ruined Fresno’s season and now Utah State comes to town after playing poorly against Colorado State last week.